Since the Australian dollar has been so low, cookbook purchases have become more considered. I had been looking online at Keep It Vegan by Aine Carlin, and had marked it as future buy. However, I happened to come across it on sale in a local bookshop, and I snapped it up. I am so glad I did! Before I go on, for Australian readers it is still on sale for just $12.99 at QBD, and there is free shipping. So get online and order yourself a copy pronto! I love this book. I am absolutely delighted by it. Aine writes wonderfully, it has a lovely layout and beautiful photos, and the recipes are great. There are some very clever twists on classics as well as inventive dishes, but everything is very manageable. The chapters are separated into Breakfast, Brunch & More, Midday Meals & Simple Suppers, Something Special, Sides & Sauces, and Sweet Treats. So let's see what I've been making! 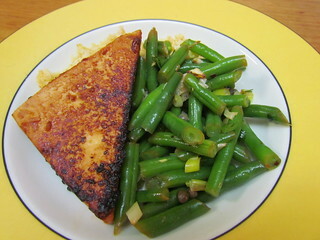 Sweet & Sour Marinated Tofu and Green Bean Salad with Lemon, Garlic and Chilli: This dinner was made up of two recipes from the book. The tofu is amazing, the flavour is great and it was so juicy. I'm pretty sure this would convert anyone to tofu. It requires a minimum of an hour soaking time, I left mine for three hours. The salad was easy to make, and was tangy and fresh. I didn't use fresh chilli, just a sprinkle of chilli flakes. I served it all with some cooked millet. Bircher Muesli: I made a half batch of this for a single serving, but did increase the milk a bit (I use oat milk). I also left the apple, raisins, coconut and seeds to soak overnight rather than adding them the next morning because I like when they go all juicy. 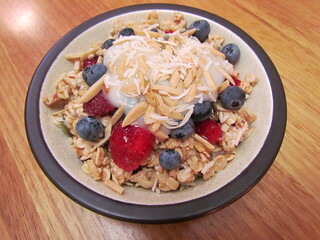 Topped with almond yoghurt, dry-roasted almonds, fresh berries, more coconut and agave. This was a good start to the day. 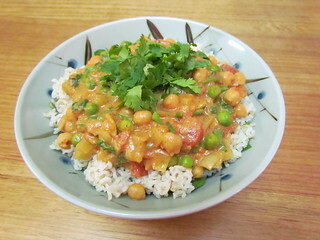 Chana Masala: Aine says this is one of her go do dishes, and you can tell she has perfected it. This was delicious! I added some peas to the mix as well, because of greens, and served it over brown basmati rice and baby spinach (more greens) with some chutney to serve. This says it serves 4, but really it served 2-3 with my hungry appetite. 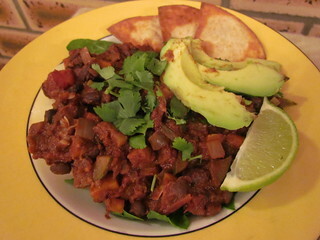 Hole Mole Black Bean Chilli: Such a great chilli. Of course I fiddled with it to make it Susan friendly, adding a sprinkle of chilli powder only, leaving out the tobasco and flakes, and using zucchini and carrot instead of capsicum. I also only used one tin of beans rather than two, which was fine - it wasn't too saucy, and got three serves out of it (a full recipe with two tins serves 4-6). I only did one tortilla to try my hand at making the tortilla chips. I managed to both burn it a bit but still have it being soggy. Frying is not my strong point, but it was fun to try. Served with a baked potato and baby spinach. 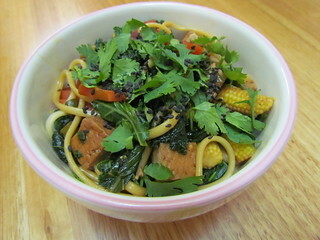 Weeknight Noodle Stir-Fry: This was the first recipe I made. It comes together quickly, has a tasty sweet chilli based sauce (not too spicy), and has heaps of vegetables. Santorini-Style Spaghetti with Lemon, Capers and Tomatoes: This was really nice. 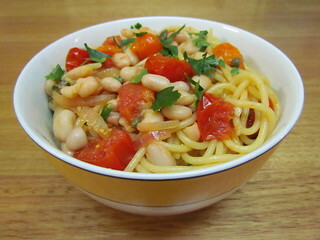 I used 300g of spaghetti (rather than 400g) and added a tin of white beans and got 2 serves (it says it will serve 4). Next time I would double the sauce, because it is really nice. 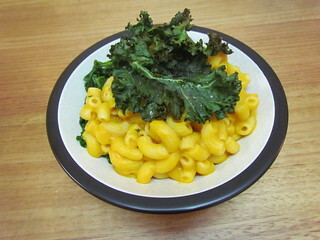 Macaro-No Cheese with Crispy Kale: This is not a vegan mac and cheese recipe. Imagine the most delicious pumpkin soup ever, but poured over macaroni, and that is what you have. This is SO good! You can add a nooch sprinkle if you want, but to be honest this really doesn't need it. Which is like the highest praise I can give. The crispy kale is a nice addition as well, and I sauteed the remainder of the kale and served the pasta over it. Indian-Spiced Tacos with Mango Salsa: This is my first foray into the Something Special chapter. It involves making a couple of components - sour cream, mango salsa and spiced chickpeas, but they all come together easily. The sour cream is amazing, and was a fun way to use my new blender... so smooth! It calls for the juice of 1/2 a lemon, and I used 2 1/2 TBS of lemon juice. The salsa is so refreshing wiht mango, avocado, corn and tomatoes. I left out the chilli and the onion due to personal preference. 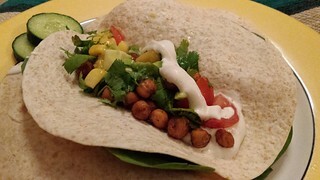 I only made a half batch of the chickpeas, but really you can make more because even if you don't use them all in the tacos they are so delicious and snackable. Put it all together and you get a lovely, fresh dish that was just great for the warmer summer months! 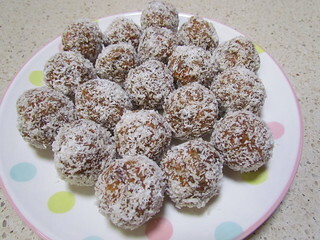 Carrot Cake Bites: These are delicious, and really do taste exactly like carrot cake even though they are entirely fruit and nuts and carrots and spices. 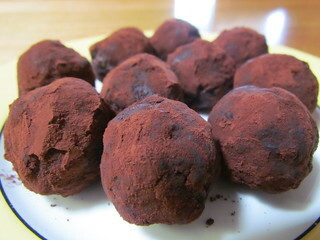 The recipe says to make into 12-14 golfball-sized balls. I used an AU tablespoon as my guide and for 22 balls. 12 balls would be huge! Chocolate Peanut Butter Bites: More balls. These are again delicious, based on dried fruit, nuts, peanut butter and cocoa. I didn't have any date syrup, so I just threw in an extra date and it was fine. I got 11 balls using my AU tablespoon as my scoop, and the recipe says it makes 12. I firmed mine for 4-5 hours in the fridge before serving. Once again I have to say how much I love this book! Aine has a new book coming out, The New Vegan. Although it is not technically published until the 31st of December, I ordered a copy off The Book Depository and it arrived yesterday. It is a beautiful book and I am looking forward to reading it and cooking from it. A flashback to this photo of the handsome Prince, a clinic cat who is sadly no longer with us. 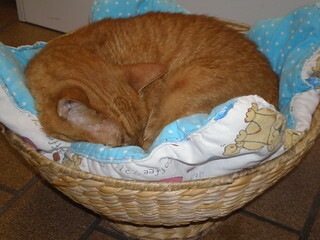 He loved curling up in baskets. Thankyou! Just ordered a copy! Cheap, woo! The food sure does look delicious! I check a lot of vegan cookbooks out from the library, since they are usually a little out of my budget! I never think of getting them out from the library. I guess because I always make heaps of notes and cross references in my books before I even cook from them! But it is a good idea for getting a feel for new books before I commit to them. I haven't even heard of this book - it looks fantastic, especially those Chocolate Peanut Butter Bites! It is one of my favourite all time books now. Love it! Prince was a very cute kitty. It is so good! I've made heaps more recipes from it as well that have been great. I have this book too. I got a cheap copy from a discount book store. I've only made a couple of things from it and I was a bit disappointed - the chocolate mint cake and the cheese recipe. They put me off and it's just been sat on the shelf so I'm glad you've posted this as it's made me want to go back to it and try more things.